A novelty at Tucson 2013. Sharp, brilliant, octahedral crystals. 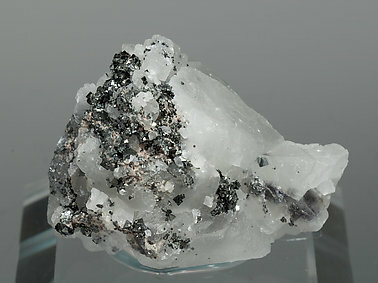 The contrast between the black Jacobsite crystals and the white Calcite makes this specimen nicer than usual. A novelty at Tucson 2013. 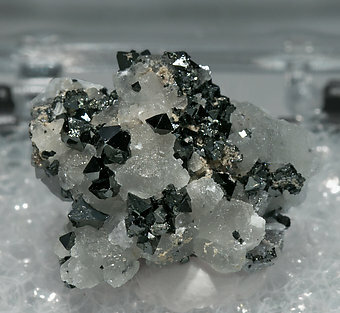 Groups of sharp, brilliant, well defined octahedral crystals on a matrix of Calcite crystals with small Andradite crystals. 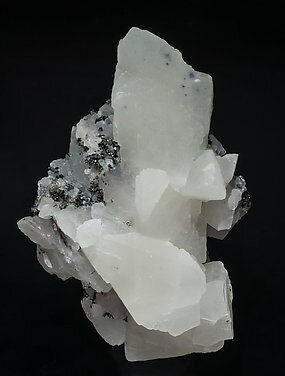 The Jacobsite crystals strongly contrast with the white Calcite and make this specimen nicer than usual. 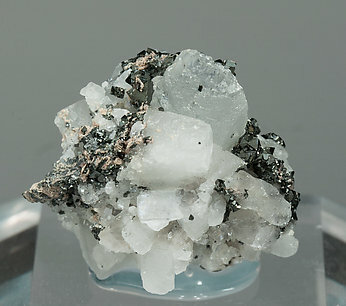 Groups of sharp, bright and well defined octahedral crystals on a matrix of scalenohedral Calcite crystals with small Andradite crystals. The Jacobsite crystals strongly contrast with the white Calcite and make this specimen nicer than samples from other finds. We will send a copy of the Jacobsite and Andradite analyses to the buyer.